As you probably know, I am a beer hound. I love to drink beer and try to find new beers to try whenever I get the chance. 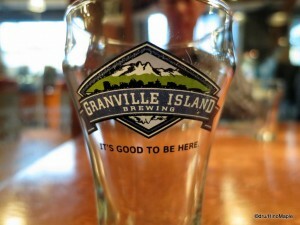 This time on my trip to Vancouver I embarked on a trip to the Granville Island Brewing to go on their tour as well as to sample some of their beers. I had been introduced to Granville Island Brewing at the young age of 19. It was the very first beer I had tried upon a recommendation of a friend. Since it was the first time I had beer in my life, I honestly didn’t like it. I was being a bit secretive as I was still young and trying to hide the fact that I drink from my parents. I knew it was silly as I was of legal drinking age but it didn’t matter. I was still a “kid” when it came to drinking and I was just starting to experiment with it. Unfortunately I didn’t enjoy it and avoided Granville Island Brewing beer for a long time. It wasn’t until this recent trip that I actually went about and gave it a real try by heading to their main shop and brewery located on Granville Island, where they get their namesake. Granville Island Brewing is a very easy place to find. Located at the entrance of Granville Island, you can’t miss it. If you are walking, finding Granville Island is a little difficult but as long as you keep heading under the Granville Street Bridge, you will find it easily. The first time is always the hardest. Once you are there, you are not going to find anything terribly special. There are actually two sides to the shop, the first is the Taproom area where you can order a few pints if you so wish. 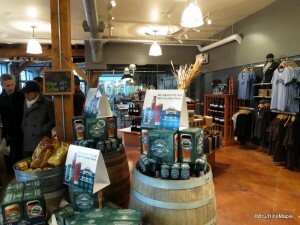 Then there is the retail store side where you can buy various bottles and cans of Granville Island Brewing as well as some of their merchandise. This is where you can join a tour. Tours typically run 3 times a day at 12pm, 2pm, and 4pm. I was pretty lucky to arrive just 15 minutes before the 2pm tour and they had 2 spaces available. We grabbed it quickly and just milled about the store for 10 minutes before heading into the glass “conference room” where the tour began. The tour guide was a bit sassy which added an interesting character to the tour. It was a very simple tour as we only had to go to a few places. They gave us a few disclaimers before we headed to the brewing area next to the Taproom. We moved to the back where the guide proceeded to explain the entire process from malt to bottling. We then got back to the “conference room” where we were allowed to sample 3 different beers. Unfortunately we couldn’t choose which ones we wanted individually but we were allowed to choose 3 different beers based on our group. Our group settled on an Island Lager, Maple Cream Ale, and the Saison, a limited time beer. All of them were good. The Saison is a very nice beer that was brewed in a Belgian style. For me, Belgian beer brings memories of the summer when I went to the Belgian Beer Festival in Roppongi last September. It was still pretty hot at that time and enjoying a few beers was great. I feel that the Saison was brewed at a good time, but enjoying it on a cold November day was a bit difficult. I was dreaming of being in Tokyo during the summer and enjoying this beer on a terrace watching people walk by. The Island Lager was our cleanser beer. 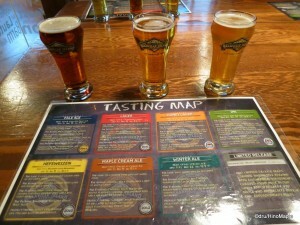 It was a base to “clean our palate” and to compare Granville Island Brewing beer to other beers on the market. Granville Island Brewing is a microbrew producing less than 7 million litres of beer a year. It is also a craft brewery using only natural products with no preservatives in its beer. The tour guide advised us to try the Island Lager to give us an idea of what a true craft brew tastes like. I was impressed and enjoyed it a lot. The Maple Ale was the one I liked the most. I was told that the maple taste would be noticeable to a non-Canadian but I could taste a hint of maple within the beer. It was the best of the three I tried and really good on a cold day. I wish I could bring more back home with me but my suitcase was full and I couldn’t bring anything else back with me. It’s a shame I couldn’t bring more back with me but it gives me another reason to return home sooner rather than later. From my first experience of drinking Granville Island beer to now, I have a completely different view of it. I just had a bad experience and a poor ability to taste the distinct tastes that beer can have. I am happy to have gone back to drink a little more as I enjoy it a lot. I wish they would export a little to Tokyo once in a while but it is very unlikely to happen. I have recently thought about putting on a Canadian beer festival in Tokyo, but without the proper connections it would be impossible for me to do. It is something I feel the Japanese people would love and it would help to promote Canada to the people of Japan. While I feel that a lot of the craft beer is not going to be able to export their product to Japan due to the limits of their production, I believe that a tourism festival would be a great idea and would encourage people to visit Canada. The Japanese people love beer and alcohol and being able to showcase the wonderful industry that is in Canada would be one way to improve this. Lots of people visit Belgium for the beer alone, and I think Canada could do the same. Hopefully someone with the right connections will be able to do this and I can enjoy great Canadian beers in Tokyo someday. This entry was posted in Canada Food and tagged Ale, beer, Belgian Beer, canada, craft brew, GIB, Granville, Granville Island, Granville Island Brewing, Granville Island Lager, Granville Street, Lager, Maple Cream, Maple Cream Ale, microbrew, Saison, Tap, vancouver by Dru. Bookmark the permalink. Yes but Belgium has chocolate too! 😀 I tried to Google Canada’s chocolate. It looks like a combination of British (Cadbury’s) and American (Reese’s and Hershey’s). Oh. Sorry. This is a post about beer and I’ve hijacked it with chocolate. So legal drinking age in Canada is 18? Legal driving age? Voting age? Drinking age? Vancouver it’s 19. Maple Cream Ale? Sounds very interesting. 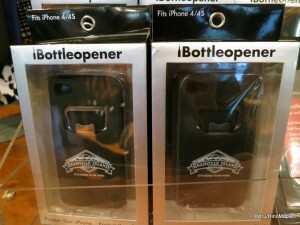 Must be very different from the beer we usually have in Japan. I wish we could have it in Japan, too. So easy once you learn how to use it. Hope you enjoy the daily photos that I hope to post. We’ll see how often I keep it up.